CabinetCote LP | Hawk Research Laboratories, LLC. 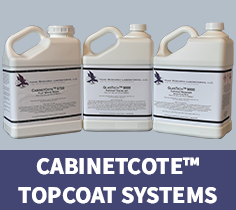 CabinetCote 9700 topcoat system is designed specifically for vertical surfaces, such as cabinetry, because it sprays similar to a lacquer and dries fast to prevent sagging. CabinetCote 9700 topcoat dries in a low-gloss, matte finish and hides grain well with little surface preparation. In addition, cabinets doors can be sprayed in place and do not need to be removed which saves valuable time. CabinetCote 9700 topcoat system is available in matte and gloss finishes in white and select off-white colors.